What is the film about and what led you to make it? The film is 10-minute allegorical depiction of the sociopolitical situation in the world as we have been experiencing it over the years or to be more specific from the time man formed the first structured societies. It doesn’t try to give a political view but rather examines the effects of social injustice and the breakdown of power. It is titled “Dinner For Few”. During dinner, “the system” works like a well-oiled machine. It solely feeds the select few who eventually, foolishly consume all the resources while the rest survive on scraps from the table. Inevitably, when the supply is depleted, the struggle for what remains leads to catastrophic change. Sadly, the offspring of this profound transition turns out not to be a sign of hope, but the spitting image of the parents. 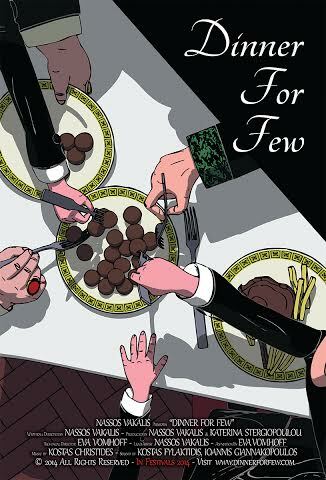 “Dinner For Few” was inspired by the economic recession affecting South European countries like Greece, Italy, Spain and Portugal. I grew up in Greece, where part of my family and most of my friends still live. 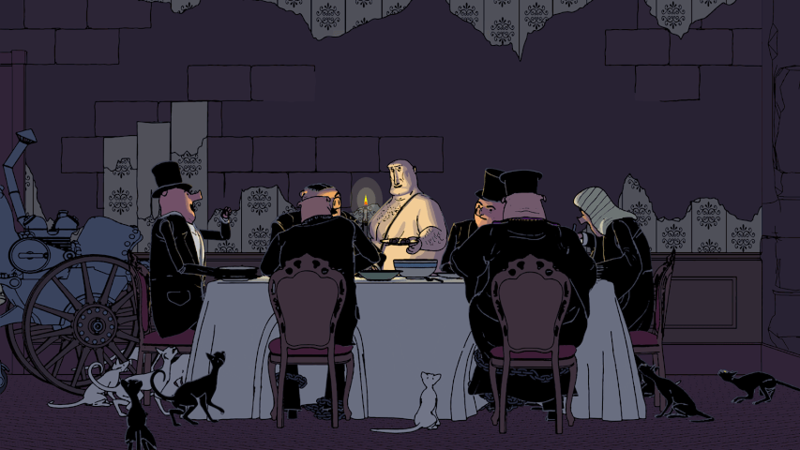 “Dinner For Few” not only reflects my deep concern of the social and economic developments during the crisis but also highlights the inevitable and cyclical nature of the human affairs throughout history. This has been one of my own personal projects. I came up with the idea as I was talking to a friend on the phone about the economic situation in Greece which has been deteriorating over the years. We talked about outdoor tavern cats stealing food from the table and that became the core idea around the film. I wrote the idea to a script adding some drama and details to emphasize the allegorical meaning of the story. I also directed the film and served as a lead artist. Soon after starting working on the models I found Eva Vomhoff from Germany who had a few pointers on the use of a specific plug-in. I showed her what I wanted to do and she quickly joined the team as the technical director and later as an animator in the film. Besides her excellent models and riggs she took it upon herself to animate most of the cats as well as the tiger that appears at the end of the film. This pretty much sums the people who worked at the technical and visual part of the film. Like my previous film I tried to stay away from dialogue. The main characters of the film are mainly pigs and cats so they do some “animal” sounds but there is nothing specific about them besides the tone of their voice which expresses their feelings at the particular scenes. So there was no need for actors to do voices. Besides myself and Eva there is a larger group of people who worked on the sound and music part of the film. I have asked Kostas Christides, a talented young music composer with credits in many Hollywood and Greek movies, to write an original music score. He composed something which was so effective that we end up going to Bratislava and recorded a 70 musician’s orchestra which we later mixed here in Los Angeles to finalize the music score of the film. I created a short video about his approach and the making of the music which you can view at youtube. While Kostas was working on the music I hired two very talented sound design artists from Greece Kostas Fylaktidis and Ioannis Giannakopoulos to work on the sound design of the film which they later mixed with Kostas’s music to a very effective surround sound track. What technology was used in its creation? In my effort to keep the budget under control the film uses off the shelf 3d animation software and plug-ins. Most of the programs we used are inexpensive and definitely not what most people will expect we used, but I think they programs worked pretty well and the outcome is effective. I started the work in Carrar3d a relatively inexpensive 3d application but later when Eva joined the team we moved our rigging and animation to Messiah studio. All the technical work was done there and after the animation approvals it was transferred via a MMD plug-in to Carrara3d for layout and rendering. 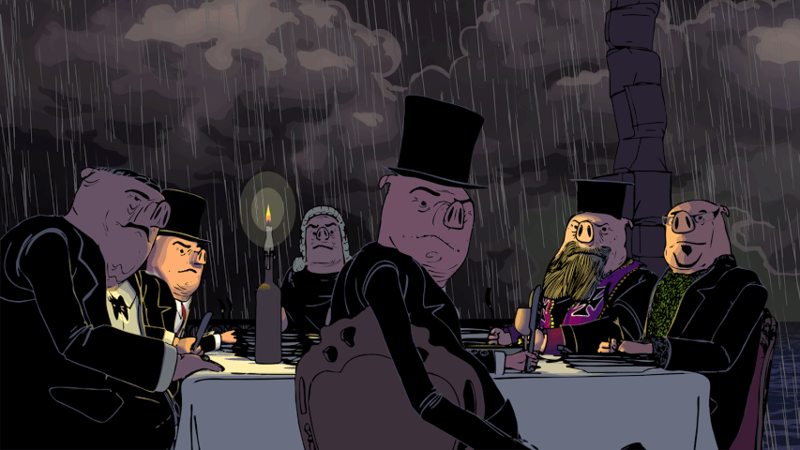 The film employs a nontraditional CG rendering look. It uses flat graphic colors with dark outlines and hard shadows. This stylistic approach is more relevant to the theme of the story and is reminiscent to the hand drawn 2d animation style in comparison to the photo-realistic renderings we are used to see in many contemporary CG animations. 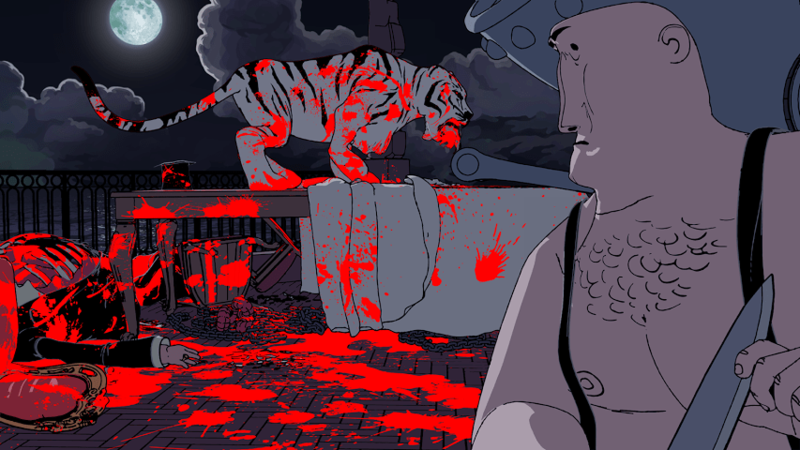 The film’s finale includes a bloodshed sequence animated in a cut out graphic approach using only red and black silhouettes. In order to achieve the 2d look I created a simple pipeline that treats the animation and achieves the result. This treatment had two parts. One was the rendering look which is as mentioned earlier is flat, graphic and with an outline and the other was the animation itself. As far as the look a lot of effort was taken so the outline doesn’t look mechanical or generated by a 3d outliner. For this I created a special Photoshop action that flares the line to a thick and thin quality. This involved the vectorization of the line with a low tolerance path and then coloring it and rasterizing it. For the animation I found a way of adjusting the MDD files in Carrara3d by adding in-betweens almost in a 2d fashion. This took some of the smoothness out of the curves and made the movement more 2d like. Last but not least some water effects were done in Blender which is a free software. All post work and composting was done in Adobe After Effects SC6 and the editing was done in Premier Pro. I funded the film with my own money. Initially I thought I could do a kickstarter campaign but soon I felt that this was possibly a waste of time and I wanted to put my efforts into the film rather than trying to finance it so I never started the campaign. In the beginning the film had little experiences anyway. My only other team member, Eva Vomhoff was volunteering her work and I only needed a new computer to handle the requirements of the film. I started the work on my Mac but a few months later I transferred everything to a PC environment so I needed a new PC with a good graphics card. Most of the cost went to the production of the music and sound design. This included the fee to book the orchestra, mixing the various orchestra takes and the final sound design and mix. There are some additional experiences on producing the final DCP prints, Blu-rays, DVD and submitting the film to festivals or doing promotions. The actual cost end up around 16.000 dollars though I’m sure some more expenses will come up soon as the film needs more prints, promotions and advertisement. What is the end result for the film? Series? festival? theatrical? Awards? I hope to be able to send this film to as many festivals as I can. In reality there is not anything more someone can do with a short film. I also hope I will be able to submit it to the Academy for consideration. To do this I must win either a qualifying festival or do the required screenings at a Los Angeles cinema. There is some interest in Greece to see if the film can be placed before a feature and get a theatrical release there but is kind of early to think about that. When the film finishes the festival rounds I hope I can put it online or in one of the platforms people can download it for a small fee. For the moment though I would like to invite people to visit the Facebook page like it and share the trailer. This is a tremendous help for the film because it generates publicity. Tagged Adobe After Effects, Premier Pro, Spotlight.